This morning, Yukon, North West Territories and Nunavut wireless provider Ice Wireless announced that it’s working with Parallel Wireless, a U.S.-based telecommunications equipment provider, to speed up the deployment of its 4G LTE Advanced network. Parallel Wireless sells a variety of small scale networking solutions that allow carriers like Ice Wireless to build out 3G and 4G connectivity at a fraction of the cost of traditional solutions. One of the company’s cornerstones products is a piece of software called an all IP virtualized radio access network (vRAN, for short). A radio access network is one of the key components in the architecture of any wireless network. RANs sit between consumer-facing devices like smartphones and computers and the core network, helping connect those devices to the larger network. Essentially where the likes of Nokia and Huawei ask clients to buy an expensive hardware component for their RAN needs, Parallel Wireless offers allows companies like Ice Wireless to use off-the-shelf computer and server components to emulate a RAN. The company also sells wireless base stations like the two pictured above that are smaller than the average cell tower one sees in cities and less remote parts of the country. Besides reducing the overall price of a network deployment, Parallel’s components present several other advantages for a company like Ice Wireless. For instance, small base stations make it easier for the company to build redundancies into its network, something that’s especially important when a single arctic snowstorm can knock out wireless service for thousands of people. They also take less time to install. According to Tore Stenbock, director of wireless voice networks at Ice Wireless, in a best case scenario when the weather is fully cooperating, the company can install a new tower in as little as two weeks. 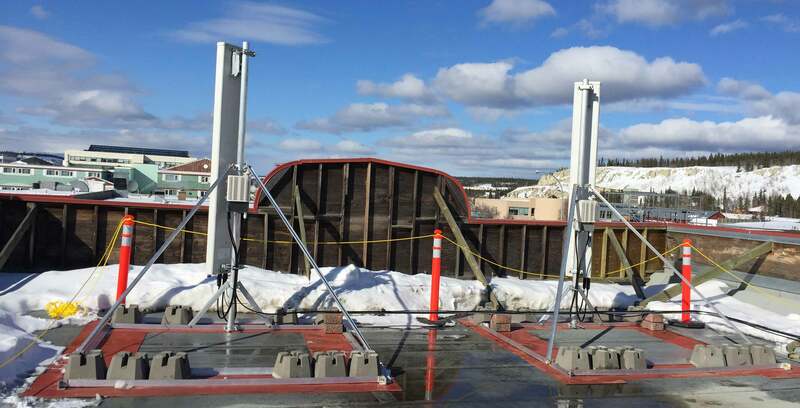 More often than not, however, it takes closer to two months to install a new cell site due to factors like low visibility and sub-zero temperatures. Moreover, the company only has about three months of good weather in which to work outside. One other advantage the small antennas present is that they’re easy to deploy on top of buildings. In the installation pictured above, Ice was able to without install the antennas without penetrating or otherwise altering the structure of the building. Earlier this year, Ice launched its first LTE Advanced network. At the same time, the company became one of the only Canadian carriers to offer an unlimited data plan when it launched an $89 plan that offers unlimited data to subscribers.